In the end, we must have clean air. But we have to be smart about this and set achievable and fixed goals our communities can meet. Veterans are prime candidates for tech positions because of their military discipline, ability to work under pressure, and teamwork. I am pleased the Department of Transportation has completed this grant process and approved the final phase of the runway rehabilitation project. This bill takes another major step forward to bring our communities the water they contract and pay for by increasing pumping and speeding up the process to approve new water projects. I hope that when people pass by the Merle Haggard Post Office Building in downtown Bakersfield, they will remember an icon of our community. The Waters of the U.S. rule was a ridiculous usurpation of power by the EPA. This is about making sure millions of people in California and across America have the water they need and deserve. Once President Trump signs this into law, I predict we will begin to see the cultural change at the VA, and our veterans will get the care we promised them and they deserve. Congressman Kevin McCarthy talks high-speed rail, the San Joaquin Valley Water Reliability Act and the debt ceiling on Bakersfield's KGET-TV. A bill to raise the debt limit without spending cuts attached would not get a single Republican vote in the House, the GOP's top vote-counter said Wednesday. A congressional field hearing in Bakersfield Friday injected Kern County into the heated national debate over how to balance U.S. energy and economic needs with health and environmental protections. 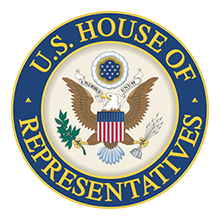 Congressman Kevin McCarthy recently honored students from each high school in his congressional district in Atascadero.